In the fall of 1996 I left behind a career in marketing to begin anew as a spiritual counselor, sharing the Formula of Compassion (Formula). I was inspired to share the Formula after I had experienced its life-changing effects. My little counseling practice blossomed and within less than 6 months I took on two new partners, Dermot and Terry. Both had chosen to join forces with me as a result of their experiences with the Formula. In less than 4 months our business grew into a company that we named The Nibiruan Council. We chose this name in recognition of the ancient wisdom given to me from an off-world group who identified themselves by that name. Our goal was to bring the Formula to the world. After several months of teaching it and holding workshops, we decided it was time to see how people were doing using the Formula. We discovered that though they were having success getting the release from the thymus or high heart, there were times in which they just couldn’t make it work. After much thought I realized that the problem stemmed from the fact that they didn’t understand the purpose of the Interlife, the life between lifetimes, or how much the contracts and promises that they made while there impacted their current lifetime. Another tool was needed; one that would expand their understanding of the Interlife and the contracts and roles that we agree to perform while we are there. This tool would provide a graphic picture of what a person who has agreed to play a dark role for another must go through in order to keep that promise. It must show what their coming life will be like in order to mould them into the kind of person that can inflict pain. It must also define the reason why we would ask someone to play such a role for us and what our obligations are. I didn’t have long to wait for my need to be fulfilled. 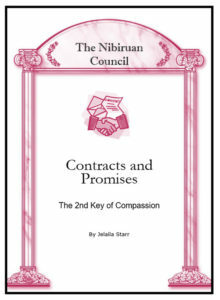 Through counseling one very special client named Ellen Marie, I discovered this tool; a new key that I named Contracts and Promises. It is my hope that Contracts and Promises will enable you to complete the Formula and free yourself from the pain of the past so that you may open your heart to fully love again.